Jacobean furniture dates all the way back to the year 1600. The revival of this style lasted for almost a century. The period represents the growth of foreign influence and the passing of the oak styles. The Jacobean style was made popular during the reign of James the first and was also popular under his son Charles the second. The earliest Jacobean furniture was influenced mainly by Elizabethan (1603 -1688) styled furniture. During this time the furniture took on different styles. Early Jacobean furniture was somewhat inward looking, not fully embracing exotic influences that were more ornate. Colonial Americans copied the early styles of the furniture as best as they could since they did not have skilled furniture makers. Commonwealth Style (1649-1660) marks the middle of the Jacobean Period, when the furniture was of simpler design and undecorated. The late Jacobean Period is that of the Carolean period, named for King Charles II. Charles the first was more cultured than his father and took much care and interest in the furnishings of his palaces and mansions and especially in the collection of great art and paintings. During Charles’s reign over England, he paid more attention to domestic comfort with much more use of padded upholstery, carpets instead of rush mats, and finer embroidery. The Latin name for James is Jacobus. The English style in vogue beginning with James I’s reign is referred to as “Jacobean”. The Jacobean, or Jacobethan, era was another phase of English Renaissance architecture, theatre, and decoration and formed a continuation, begun in the Elizabethan age, of the Renaissance’s penetration into England. In America, Jacobean style furniture is synonymous with Pilgrim style because the early English settlements in America took place during the Jacobean era. Very little American furniture of the earlier part of the Jacobean period is still surviving; but later pieces, from about 1670, are more numerous. Most of the American primitive furniture was produced during this period by colonists to make do, because there were few skilled cabinetmakers in the colonies. There were many different features in the Jacobean furniture style. Oak was the chief wood and Ash and maple were used for turning and whittling. Using pine wood was also a popular method. There were also a few different types of Jacobean furniture. This included turned chairs, highly carved mirror frames, footstools, and gateleg tables. Upholstery was used to improve chairs. Upholstery is the work of providing furniture, especially seats, with padding, springs, webbing, and fabric covers. Materials such as silk, tapestries, crewelwork, linen, velvet, and even leather were used on various types of chairs. There were four different chair styles in the Jacobean era that included three-legged, carver, and Brewster. Almost all flat surfaces on chairs, chests, etc. are carved in low relief. Jacobean furniture was very sturdy, massive in size, notoriously uncomfortable, and made to last. The furniture pieces that were produced consisted mainly of chests, cupboards, trestle tables, wainscot chairs, and gate legged circular tables. Some veneering and inlay were used, and many pieces were painted. Spiral turning was also very popular. Tables were rectangular in shape, with small melon ball turning on the legs. As a rule, Jacobean furniture construction was simple. It was assembled with mortise and tendon joints, held together with pegs. Jacobean period furniture can mainly be found in the auction houses of England. Being built to last, many pieces have not only survived, but are still in good condition. Understandably expensive, most “Jacobean antiques” available for sale are actually 19th century reproductions. Lines of furniture today have the same styles and will reference the Jacobean era. Buying antiques and fine art is a very enjoyable experience but can have its pitfalls for both professional dealer and amateur alike. In this short guide, I hope to be able to give an insight in how many dealers operate in the international market. This is by no means a definitive working practice in every case, and the views presented here are simply personal ones based upon 20 years of experience. Nevertheless, I believe that they have some merit and have served me well over the years. Firstly, a professional dealer is no different from a private collector or individual when it comes to making a purchase. What many people forget is that dealers are also owners of their stock. They put their money where their mouths are in the hope that they can turn a profit. Sometimes the market is such that they cannot sell an item for many years, or if they do will have to take a loss on their original investment. It happens to every dealer at some stage, but that is the learning curve they, and everyone else for that matter, is on. We are all just fallible after all. This brings us nicely to a set of informal buying stages that I operate by on a typical transaction. So here is the first. Do you love the item? Forget the investment potential. Forget the price. Forget any selling schpeel or scarcity of the piece. Forget the worry of where you’ll put it at home. Simply, do you like it? How do you respond emotionally to it? Whether you are an individual or dealer, only you can really decide this. OK, so you’ve fallen in love with a piece. Now what? Can you afford it? So let’s say that the piece you have chosen has an affordable price tag – and by that I mean on a personal level you will be able to pay for it without mortgaging your home or selling your children! Only you can gauge this, and the same also applies to the dealer. After all, they could be stuck with it for sometime and not be able to free up their working capital. What price are you prepared to pay? This is where for the most part the dealer has the edge on a private client. It is their specialist knowledge of market prices and current trends, which will assist them greatly in completing a sale, that will in turn be driven by their business margins. So how can an individual ‘compete’ with a dealer? Well there are many ways, which we’ll touch on later in the article, but here is the main one. Research. It’s somewhat obvious, but if you are buying anything with a signature, try to research the artist. If the piece is attributed to someone, what is the basis for the seller claiming this? This is also loosely described as provenance – the holy grail of authenticity. Provenance could include, but not be limited to, anything from a verifiable source of past ownership to documentation proving the substance of the piece. It may also just be a gut feeling for example where an old lady has had something in the family for as long as she can remember. Remember this though, never take anyone’s word for what you are looking. It may be that the seller is simply trying to turn a quick profit and hasn’t dug too deep into an items value in either direction. Now I’m not advocating a cynical view to buying. For the most part private and trade sellers are honest people simply trying to make a profit and not deceive, but it is amazing how often this lack of research happens. If you don’t believe me, look at the many stories of hugely valuable treasures being discovered at car boot (garage) sales or in auction. Remember the Chinese vase that sold in the UK for in excess of £45m, well that was valued earlier by a dealer at £800. Ooops. You can’t be an expert on everything, so the lesson here, is do your research. You may not get it right every time, but it will pay dividends in the long run. But where and how I hear you ask? Well you’ll find that the internet is a hugely valuable and free resource for this. There are also subscription based services which will track a particular artist or edition in the salerooms worldwide. See Benezit online (soon to be launched), Artprice etc. The internet has really changed the way the way in which we shop and consume all sorts of products. For the novice, it is an invaluable tool for researching whether there is a similar item for sale, and at what price, or to simply learn more about the piece you are about to purchase. Within the trade, there are mixed views about this, mostly because this kind of market intelligence was predominantly the domain of the professionals and it is seen as somehow weakening the commercial advantage. I’m of the opinion though that this sea-change of the way we now acquire art it is a good thing, as in the long run it benefits everyone dealing in expensive works of art and raises the reputation and transparency of those bona fide dealers. Now a word of warning here about using auction salerooms as valuation indicators. An auction price is simply a measure of what someone is prepared to pay for a piece in a competitive environment – nothing more, nothing less. Along with frequency of appearance on the open market, these are broadly how market prices are ‘set’ for an item or artist. Remember Stage 1? That is principally what is at work here and why dealers and private individuals get carried away and sometimes pay beyond their set limit. Then again, that’s the excitement of a ‘room’ – they are environments that provoke tests of nerve, bank balances and many times a large measure of egos thrown in. If you’ve never been to an auction, then I urge you to go. They are great fun, but if you do happen to see something you want, set your limit and stick to it. A useful trick is to imagine yourself as a big cat hunting on the plains of Africa and your prey is an auction item. Sometimes you’ll give chase and be successful, but more often than not you’ll have to let it go to conserve your energy (read money!) and live to hunt again. If you do get carried away though, don’t worry. We’ve all done it, and at the end of the day you’ll come away with something you love. Right? Ok, enough of the analogies. You get the picture. Back to the matter in hand. What do you pay? If you are a private client, the answer to that is, what is it worth to you? Assuming that you have done your research, the piece checks out and you love it, what’s the next move. How do you actually negotiate a sale and what do you say and do? Here are my thoughts on this. a. Now I’m a great advocate of telling a seller that you love the piece. It doesn’t weaken your position. This is a Stage 1 statement and nothing to do with what you will ultimately pay. This doesn’t mean that you’ll not have any bargaining points either; it simply aligns you with the seller on an emotional level. You can even get into a bit of small talk on where they found it and how long they’ve had it etc. b. As an opener, ask the dealer what their best price is. If they try to draw you on what you’d be prepared to pay, simply joke with them and tell them that you can’t be both buyer and seller! c. If you think that the piece is worth 40% less than they are asking (this is a bit extreme), then tell them that you see it at 50% less than what they are asking (this will give you a bit of a buffer). The principle here is start low and keep it friendly. You can always go up, but never down. Once the seller has regained consciousness (!) they’ll probably tell you to get lost. d. At this point you’ll need to reinforce that you love it and you are serious. You can do this by saying ‘look, this artist /sculptor/item recently sold for X amount in auction’. It shows you have done your research. If they haven’t done the same then you’ll have an advantage. If their asking price is close to the last auction room sale, try to average out the previous saleroom performance for the piece/artist. If the seller is insisting that this is the value then you can always say that on the day that’s what someone was prepared to pay and today is another day. Remember to keep it light and friendly. Don’t get ruffled or intimidated by a sellers apparent indignation at your offers. e. Ask them where they ‘see it’. They’ll probably drop a bit. f. At this point start to focus attention on the item. Is it in perfect condition? Has it been repaired or restored, all of which can affect value. Is there something that you can use to reduce the price e.g. is it a picture which needs reframing or relining? Perhaps it’s a bronze which needs repatinating. Remember to reinforce that ‘you love it but because of XYZ you see it at X price. g. It is not uncommon at this stage for a seller to tell you that your offer is lower than what they paid for the item. This may or may not be true, but most dealers will have at least a 20% margin in the piece, so even at this level you’ve got, say, a 10% discount you could negotiate. h. Assuming that you are both engaged in the negotiating process (in as much as there have been at least three price movements of at least 5% (of original asking price) and moving closer to a ‘strike price’ you’ll find that at this point the going will probably get tougher. i. You can either agree to the sale if you think it’s fair or decide on a more extreme tactic of calling the sellers bluff and walking away. Stand up and say something like. ‘Look, you know I love it, but we’re just too far apart. I can do X amount’. This can provoke them to agree to your price or it may not. If not, walk away. Now you may be willing to pay more and think you may have blown your chances, but you haven’t. So where to now? j. Spend some time to think and calm down. Do you still love the item? Can you make the ‘strike price’? What really is your limit? k. OK. Final round. You go back to the seller. Say something like ‘Well I’m back. I just can’t forget that picture/sculpture/piece. Look, what is your very, very best on it?’ They may make some final concession which is within your top limit, or they may not budge at all. You’ve probably got only another couple of price moves here at the most. l. So now it’s crunch time. You’ll have three options. You agree on your maximum price, agree to pay more, but only if that includes any repairs, shipping, etc (or whatever else you can negotiate), or you walk away (remember the hunting analogy). So that’s kind of it. Every sale will be different. You will win, but some of the time you will lose. If you remember to do only one thing, it’s engage with your heart, but negotiate with your head. You won’t go too far wrong with this strategy. Good luck and happy hunting! Blue Onion is a Chinese pattern originally manufactured by Meissen since the 18th century, copied by other companies since the late 19th century and is still in production today. The “Blue Onion,” pattern was originally named “bulb” pattern according to historians. While modeled closely after a pattern first produced by the Chinese, the plates and bowls styled in the Meissen factory in 1740 adopted a feel that was distinctly their own. One of the earliest examples is the blue and white porcelains of the early Ming Dynasty in 1420. The flowers and fruits pictured on the original Chinese pattern were unknown to the Meissen painters; they created hybrids that resembled more familiar to Europeans. The so-called “onions” are not onions at all, but according to historians, are most likely mutations of the peaches and pomegranates modeled on the original Chinese pattern. The whole design is an ingeniously conceived grouping of several floral motifs with stylized peonies and asters in the pattern’s center, the stems of which wind in flowing curves around a bamboo stalk. Collectors beware …the second quality work are those with the “strike lines,” and later ones NO LONGER CARRY the BLUE CROSS SWORDS and carry the work Meissen in a oval in blue. TEHACHAPI, Calif. – Government Auction’s Sunday, Oct. 28, 2012 auction is brimming with original art, precious gems and other treasures. Antique gold coins, diamond necklaces and a fine oil-on-canvas painting by renowned California Impressionist Granville Redmond (1871-1935) are among the top highlights in the sale. Most of the 1,300 lots have $2 starting bids and will be available to bidders worldwide through LiveAuctioneers.com. The Granville Redmond work, titled “Sunny Stubblefield,” is a 9½ by 12½-inch landscape that features a slumbering ranch house surrounded by turquoise skies, old oak trees and blades of California sage grass. The label on verso reveals provenance from “Schussler Bros., Art Dealers, 285 Geary St., San Francisco. Redmond is regarded as one of the first tonalist painters of the California school. As a child, he was deaf due to a bout with scarlet fever. He attended a school for the deaf where he was taught painting, and went on to study in San Francisco and Paris. He is best known for landscapes featuring poppies, trees and mountains. “Usually paintings of this caliber are snatched up by a high-end auction house such as Christie’s or Sotheby’s. We are truly pleased to have acquired the Granville Redmond oil on canvas through a California estate sale,” said Government Auction’s chief auctioneer Paul Sabesky. The work is expected to realize $25,000-$30,000. Among the top pieces of fine jewelry to be auctioned is a stunning 26-carat diamond necklace. The 14K white gold eternity necklace measures 17 inches and is styled as a flexible “ribbon” with 59 graduating round-cut brilliant diamonds that terminate in a concealed clasp with twin safeties. Also included within the multitude of elegant jewelry pieces is a 51.28-carat tanzanite and diamond necklace. Measuring 18 inches long, it is 14K white gold with 22 oval-cut natural tanzanite surrounded by round-cut diamonds having a total weight of 7.39 carats. Those diamonds are in addition to the main gemstones, which weigh 51 carats. In total, the necklace weighs 60.30 grams. Leading the watch category is an Audemars Piguet Royal Oak Offshore men’s watch. Audemars Piguet is known as the master of precision in watch manufacturing. The watch is comprised of a black leather band with a copper case that encloses a white face and black dials. Another luxury timepiece in the sale is a 14K gold ladies’ Rolex with gold serpentine band and octagonal gold case with white face and gold numbering. A much larger timekeeper highlights the antiques section of the sale – a 3-piece Ansonia clock set estimated at $2,250-$4,500. The Ansonia Clock Company was a major 19th-century American clock manufacturer based in New York. The firm crafted thousands of clocks in a wide variety of styles that are as popular with today’s collectors as they were with families of more than a century ago. Gold coins have become a staple at Government Auction event, and based on the excitement and number of bids placed on them in the California company’s recent auctions, it’s obvious that collectors are pursuing them aggressively. A special entry in the Oct. 28 auction is an 1883 $10 Liberty gold coin. Also known as the “Coronet,” the coin was designed by sculptor Christian Gobrecht. The Coronet features Lady Liberty wearing her hair in a loose bun with a coronet on her head inscribed with the words “Liberty.” An American Eagle is shown with the words “United States of America” and motto “In God We Trust.” The composition of the coin is 90% gold and 10% copper, which accounts for its beautifully warm, golden hue. Another numismatic treasure to be auctioned is a $5 Indian Head gold coin. Last but certainly not least, a 2001 Bentley Azure stands ready to transport some lucky bidder to their home or other destination. Equipped with a ‘Special S’ package, the black with black interior luxury vehicle is in excellent condition and has only 17,000 original miles on its odometer. Estimate: $300,000-$600,000. Note: This car must be picked up from Government Auction’s premises in Techachapi, California. Government Auction’s Sunday, Oct. 28, 2012 auction event will commence at 6:30 a.m. Pacific Time/9:30 a.m. Eastern Time. For additional information on any lot in the sale, call Debbie on 661-823-1543 or e-mail info@governmentauction.com. View the fully illustrated catalog and sign up to bid absentee or live via the Internet at www.LiveAuctioneers.com. Government Auction is one of the most reputable jewelry and gem clearinghouse companies in the United States, with more than 20 years of experience. The Southern California-based firm works closely with agencies and individuals, including the IRS, bank and trust officers, and estate and bankruptcy trustees to liquidate confiscated assets such as fine jewelry, luxury vehicles, gold coins and artworks. If you have a “History Buff” on your gift list for the upcoming season, consider John J. Astor, Historical Hotel Astor, and Titanic related items to be great gifts for the holidays. John J Astor, John Jacob Astor IV (July 13, 1864 – April 15, 1912) was an American businessman, real estate builder, investor, inventor, writer, lieutenant colonel in the Spanish-American War and a member of the prominent Astor family. In April 1912, Astor earned a prominent place in history when he embarked on the ocean liner RMS Titanic, which sank four days into its maiden voyage after colliding with an iceberg. Astor was among the 1,514 people on board who did not survive. He was the richest passenger—aside from J. Bruce Ismay—aboard the Titanic. Hotel Astor was a hotel located in the Times Square area of Manhattan; in operation from 1904 through 1967. The former site of the hotel, the block bounded by Broadway, Astor Plaza, West 44th Street, and West 45th Street, is now occupied by the high-rise 54-story office tower One Astor Plaza. These collectibles covers many works, post cards, silver, China, menus and many others items all priced from a few dollars and up, something for every budget and area of collecting. These are cross over items covering American History, the golden age of fine hotels, finance and YES the Titanic. “Old Master” is a term for a European painter of skill who worked before about 1800, or a painting by such an artist. An “old master print” is an original print (for example an engraving or etching) made by an artist in the same period likewise for an “old master drawing.” In theory an Old Master should be an artist who was fully trained, was a Master of his local artists’ guild, and worked independently, but in practice paintings considered to be produced by pupils or workshops will be included in the scope of the term. Therefore, beyond a certain level of competence, date rather than quality is the criterion for using the term. Keep in mind, etching as referred in the Art Field developed from engraving on metal by goldsmiths and other metal-workers in order to decorate metal items such as guns, armour, cups and plates has been known in Europe since the Middle Ages at least, and may go back to antiquity. The elaborate decoration of armour, in Germany anyway, was an art probably imported from Italy around the end of the 15th century—little earlier than the birth of etching as a printmaking technique. The earliest process as applied to printmaking is believed to have been invented by Daniel Hopfer (circa 1470–1536) of Augsburg, Germany. Hopfer was a craftsman who decorated armour in this way, and applied the method to printmaking, using iron plates (many of which still exist). Apart from his prints, there are two proven examples of his work on armour: a shield from 1536 now in the Real Armeria of Madrid and a sword in the Germanisches Nationalmuseum of Nuremberg. An Augsburg horse armour in the German Historical Museum, Berlin, dating to between 1512 and 1515, is decorated with motifs from Hopfer’s etchings and woodcuts, but this is no evidence that Hopfer himself worked on it, as his decorative prints were largely produced as patterns for other craftsmen in various media. The switch to copper plates was probably made in Italy, and thereafter etching soon came to challenge engraving as the most popular medium for artists in printmaking. Its great advantage was that, unlike engraving which requires special skill in metalworking, etching is relatively easy to learn for an artist trained in drawing. Albrecht Dürer (21 May 1471 – 6 April 1528) was a German painter, print maker, engraver, mathematician, and theorist from Nuremberg. His prints established his reputation across Europe when he was still in his twenties, and he has been conventionally regarded as the greatest artist of the Northern Renaissance ever since. His vast body of work includes altarpieces and religious works, numerous portraits and self-portraits, and copper engravings. His woodcuts, such as the Apocalypse series (1498), retain a more Gothic flavor than the rest of his work. His well-known works include the Knight, Death, and the Devil (1513), Saint Jerome in his Study (1514) and Melencolia I (1514), which has been the subject of extensive analysis and interpretation. His watercolours mark him as one of the first European landscape artists, while his ambitious woodcuts revolutionized the potential of that medium. Rembrandt Harmenszoon van Rijn, (15 July 1606 – 4 October 1669) was a Dutch painter and etcher. He is generally considered one of the greatest painters and printmakers in European art history and the most important in Dutch history. His contributions to art came in a period of great wealth and cultural achievement that historians call the Dutch Golden Age when Dutch Golden Age painting, although in many ways antithetical to the Baroque style that dominated Europe, was extremely prolific and innovative. Having achieved youthful success as a portrait painter, Rembrandt’s later years were marked by personal tragedy and financial hardships. Yet his etchings and paintings were popular throughout his lifetime, his reputation as an artist remained high, and for twenty years he taught many important Dutch painters. Rembrandt’s greatest creative triumphs are exemplified especially in his portraits of his contemporaries, self-portraits and illustrations of scenes from the Bible. His self-portraits form a unique and intimate biography, in which the artist surveyed himself without vanity and with the utmost sincerity. It was the innovations of Jacques Callot (1592–1635) from Nancy in Lorraine. He developed the échoppe, a type of etching-needle with a slanting oval section at the end, which enabled etchers to create a swelling line, as engravers were able to do. He also seems to have been responsible for an improved, harder, recipe for the etching ground: one using lute-makers’ varnish rather than a wax-based formula. This enabled lines to be more deeply bitten, prolonging the life of the plate in printing, and also greatly reducing the risk of “foul-biting”, where acid gets through the ground to the plate where it is not intended to, producing spots or blotches on the image. Previously the risk of foul-biting had always been at the back of an etcher’s mind, preventing him from investing too much time on a single plate that risked being ruined in the biting process. Now etchers could do the highly detailed work that was previously the monopoly of engravers, and Callot made full use of the new possibilities. He also made more extensive and sophisticated use of multiple “stoppings-out” than previous etchers had done. This is the technique of letting the acid bite lightly over the whole plate, then stopping-out those parts of the work which the artist wishes to keep light in tone by covering them with ground before bathing the plate in acid again. He achieved unprecedented subtlety in effects of distance and light and shade by careful control of this process. Most of his prints were relatively small—up to about six inches or 15 cm on their longest dimension, but packed with detail. One of his followers, the Parisian Abraham Bosse, spread Callot’s innovations all over Europe with the first published manual of etching, which was translated into Italian, Dutch, German and English. The 17th century was the great age of etching, with Rembrandt, Giovanni Benedetto Castiglione and many other masters. In the 18th Piranesi, Tiepolo and Daniel Chodowiecki were the best of a smaller number of fine etchers. In the 19th and early-20th century the Etching revival produced a host of lesser artists, but no really major figures. Etching is still widely practiced today. Deeply mystical and immediately identifiable, the works of Prince Twins Seven-Seven have spurred a new level of interest in the marketplace since Material Culture offered several exciting multimedia paintings by the artist in their May 5 auction debut. The self-taught Prince Twins Seven-Seven expressed his boundless imagination in themes that blended esoteric imagery with a vibrant, traditional West African color palette. The 65 by 58-inch batik dye, watercolor, acrylic and oil-on-cloth painting featured in Material Culture’s Oct. 14 sale was purchased directly from the artist in 2007 and is one of seven of his works entered in the sale. It is expected to realize $5,000-$7,000. Other self-taught artists represented in the October offering include Vojislav Jakic, Kwame Akoto a k a Almighty God, Purvis Young and Felipe Jesus Consalvos, a Cuban-American (1891-1960) who worked as a cigar roller but whose natural talent as an artist was not widely known until after his death. Consalvos created visually stunning modernist collages that incorporate cigar bands and cigar-box paper with photographs, postage stamps and magazine images. His mixed-media collage titled “Let Dreams Come True” was created around the second quarter of the 20th century. It measures 10 x 8 inches (15¾ x 13¾ inches framed) and comes with provenance from the Fleisher/Ollman Gallery. Estimate: $1,500-$2,000. The auction will showcase a selection of items from the Bill Liske collection of early Chinese and Tibetan textiles, carpets and ethnographic artworks. Material Culture’s first offering of articles from the Liske collection – auctioned on May 26 – was enthusiastically received, said owner George Jevremovic, a cultural arts dealer of 30+ years. “The Liske collection is special because it reflects the impeccable eye of a collector who lived and worked as a mountaineering guide in the Himalayan region for three decades. Textile dealers in the area taught him how to identify pieces that were genuinely exceptional,” said Jevremovic. Liske’s expertly chosen collection has appeared at the History Museum in Denver, the Krimsa Gallery in San Francisco, the Shaver-Ramsey Gallery in Denver, and in Hali magazine. A premier artwork in the Liske collection is a powerfully rendered early Thangka scroll painting depicting the deific reincarnation known as Vajra Varahi in Sanskrit and Dorje Pakmo in Tibetan. Dating to 14th-16th century Tibet, it is valued at $3,000-$4,000. Another auction highlight is the Michaelian Meshed (31 feet by 47 feet), a circa-1900 Persian carpet originally custom-woven for the prestigious Union League Club in New York City. It remained in the club for decades until its purchase in the 1950s by Frank Michaelian of Michaelian and Kohlberg. Suitable for a discriminating owner with a palatial space, it will be offered for sale publicly for the first time in its history on Oct. 14, with an auction estimate of $60,000-$90,000. An outstanding 19th-century Syrian silk and gold judge’s tunic from the collection of Samy and Sara Rabinovic, Philadelphia, was the blue-ribbon exhibition winner at the 1996 International Conference on Oriental Carpets, and is expected to fetch $3,000-$4,000. Also up for auction is a rare pre-Columbian funerary headband made with a knotted-pile technique, valued at $1,000-$1,500; and a 19th-century Tibtetan or Bhutanese bull-headed Buddhist dance mask of meditational deity Yamantaka. The mask’s vivid red hue was achieved by applying pigment to a papier-mâché of laurel or mulberry. Estimate: $3,000-$4,000. Other categories of artifacts include an outstanding group of 17th-18th century Mughal columns and arches from northern India, 16th- to 19th-century Ottoman, Central Asian, Asian, African, Continental and pre-Columbian textiles, 17th-19th century Oriental Carpets, African, Himalayan and Oceanic Tribal Arts, antiquities from the Near East, Americas and Asia; 18th- to 20th-century folk art from Europe, Asia, Africa and the Americas; and 100+ lots of vintage Navajo jewelry from a private Pennsylvania collection assembled in the 1970s. “From the beginning it has been our goal to present pieces of diverse origin that would present collecting opportunities for every level of buyer, from beginners to advanced collectors and interior designers. In addition, we take the position that it is better to have around 400 items of very good to excellent quality – from consignors who have realistic expectations – than to create a more-specialized sale with a few stars and lots of filler,” said Jevremovic, explaining his company’s mission. “This is an age in which corporate auction departments seek to maximize their bottom lines with million-plus-dollar items or high-profile sales that have more to do with celebrity and fashion than quality or connoisseurship. We believe some of the best collecting opportunities – particularly for younger buyers worldwide – exist in the areas we are presenting in our October 14th sale: self-taught, folk, ethnographic, decorative and traditional arts,” Jevremovic said. Material Culture’s Sunday, Oct. 14, 2012 auction will commence at 11 a.m. Eastern Time. Preview: Oct. 10-12 from 10 a.m. to 5 p.m., and Oct. 13 from 10 a.m. to 6 p.m. The gallery is located at 4700 Wissahickon Ave., Philadelphia, PA 19144. All forms of bidding will be available, including phone, absentee or Internet live bidding through LiveAuctioneers.com. For additional information on any lot in the sale, email expert@materialculture.com or call 215-438-4700. Visit the company online at www.materialculture.com. Legend of the Nymphenburg Porcelains Works starts with the designs of Dominikus Auliczek. He was born in East Bohemia on August 1, 1734. Following an apprenticeship in Litomyšl, Auliczek travelled to Vienna, Paris, London and Rome to refine his skills as a sculptor. He was awarded first prize of the Accademia di San Luca for his modelling work by Pope Clemens XII. Auliczek came to Munich in 1762, as one of the best in his field. It was in 1763, he commenced work for Porcelain Works-Studio Nymphenburg as the successor to Franz Anton Bustelli. In 1772, he advanced to become royal sculptor to the Bavarian electoral court. He created around 100 figures as the model maker during this period. From 1773 to 1797, he headed manufacture as inspector and subsequently as the artistic director (until his death in 1804). Initially, still strongly influenced by the late-baroque buildings and structures he encountered on his travels in Italy, he created statuesque figures of the gods and a monumental table piece. The most pioneering design by Dominikus Auliczek is the PEARL service held in the Louis-Seize style, which was initially created at the porcelain manufactory for Elector Carl Theodor of Bavaria (around 1793). These works has been produced for over the past 100 years plus, this service was reserved exclusively for the court of the Wittelsbach family. The name of PEARL is derived from the fragile bar of pearl that lines each individual object. For the first time in the history of porcelain in Europe, Auliczek based his service on the shape of a dodecagon. Lovingly artisans applied with 792 different sepia veduta and lavish blue-gold decorations, the service was produced in 1918 for the golden wedding anniversary of King Ludwig III and Archduchess Marie Therese as a gift from their children and has, since this time, been known as the “Royal Bavarian Service”. The painted decoration consists of small oval and round landscape reserves in grey or sepia (tone-in-tone painting) with a few trees in the foreground, sometimes with a building as a “view ” and in some cases adorned with small figures of people in the spirit of Jacques Callot’s etched scenes . Even today these works are highly sought after as so many of the fine works of the Nymphenbury Porcelains factory in different variations based on original layouts dating from the 18th century. The Nymphenburg Porcelain Manufactory (in German: Porzellanmanufaktur Nymphenburg), manufacturer of Nymphenburg porcelain, is situated in the Nymphenburg Palace in Munich, capital of Bavaria, and since the mid-eighteenth century has been manufacturing porcelain of high artistic value. After his accession in 1745 Maximilian III Joseph, Prince-Elector of Bavaria, commanded the establishment of manufacturing companies in order to bail out the state finances. From 1747 attempts were made to manufacture porcelain and at the end of that year the former Neudeck Castle in the area now the Munich suburb of Au-Haidhausen was made available for that purpose. Up to 1754 the experiments were a miserable failure and lost considerable amounts of money, but in that year the efforts to manufacture porcelain finally began to succeed. In 1755 the factory received its first commission from the Bavarian court and in 1756 came the first success in painting the porcelain in color. The management of the jurist and entrepreneur Count Sigmund von Haimhausen from 1758 ensured that the factory was placed on a sound commercial footing. By 1761 it had moved to the Nymphenburg Palace, where it still is today. Among the great artists who followed Bustelli were Dominikus Auliczek the elder (1734—1804) and Johann Peter Melchior. A great promoter of the works was Ludwig I who gave them many commissions. Particular favorites were dinner services with copies of famous paintings or with Bavarian landscapes in an antique style. In 1822 Friedrich von Garner, the fashionable architect, was appointed artistic director of the factory. In the middle of the 19th century, its financial position deteriorated to the extent that in 1856 all artistic production was halted and it was decide to privatize the factory. It was leased out for the first time in 1862 and its focus shifted to the production of technical, medical and sanitary porcelain goods. In 1887 Albert Bäuml (1855—1929) took a lease of the factory. His aim was to regain the previous high artistic level of the factory’s products: it was Bäuml, for example, who “rediscovered” Bustelli. This aim was realized at around the turn of the 19th and 20th centuries and besides historical copies, elegant Jugendstil ceramics were developed. Since the 5 of January 2009, Wedgwood, Waterford and Royal Doulton has been sold K P S Capital Partners had purchased The English Manufacture works. Except for special orders and smaller ware in Jasper ware, Wedgwood jasper ware is NO LONGER produced in any volume . Most ware are now manufactured outside of the UK by other locations in the Foreign Companies owned by the WWD ( Waterford-Wedgwood-Royal Daulton ) producing other wares and not the noted Jasper ware . The more outstanding items, Larger Plaques, Portland Vases, tricolor works are still produced in the United Kingdom. The sweet dishes, small plates, small vases that we see by the thousands are what has flooded the market and still can be found in the secondary auctions. These you find in so many auctions houses, on-line Auctions by the hundreds. Special and outstanding ones can still be found on the Better Auction Houses and by dedicated Smaller Antique dealers. The older vintage works can be purchased for far less than the new ones produced and available from the Wedgwood site in the United Kingdom. 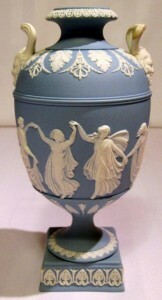 Josiah Wedgwood (July 12, 1730 – January 3, 1795, born Burslem, Stoke-on-Trent) was an English potter, credited with the industrialization of the manufacture of pottery. He was a member of the Darwin — Wedgwood family, most famously including his grandson, Charles Darwin. Born the thirteenth and youngest child of Thomas Wedgwood III and Mary Wedgwood (born Stringer; d. 1766), Josiah was raised within a family of English Dissenters. He survived a childhood bout of smallpox to serve as an apprentice potter under his eldest brother Thomas Wedgwood IV. Smallpox left Josiah with a permanently weakened knee, which made him unable to work the foot pedal of a potter’s wheel. As a result, he concentrated from an early age on designing pottery rather than making it. In his early twenties, Wedgwood began working with the most renowned English pottery-maker of his day, T. Whieldon. There he began experimenting with a wide variety of pottery techniques, an experimentation that coincided with the burgeoning early industrial city of Manchester, which was nearby. Inspired, Wedgwood leased the Ivy Works in his home town of Burslem and set to work. Over the course of the next decade, his experimentation (and a considerable injection of capital from his marriage to a richly endowed distant cousin, Sarah Wedgwood) transformed the sleepy artisan works into the first true pottery factory. Sooner than later, we will be preparing for the, “Holiday’s Shopping and Gift Giving Season.” Perhaps now is the best time to make the ‘battle Plans’ for the upcoming events. Forget waiting in line in the middle of the night for that “Door Buster, ” twelve hours to open and the madness when all shoppers will act like fools to buy that mass produced item, twenty colors and sizes to choose from and will be tossed aside and forgotten in a few months for a newer version a few months later OR regifted for another gift at a later date. So often this is the case. Why not try something new quite time tested and proven? Set your budget and think more about how each of your gifts should be tailored to the one receiving it. Give a gift of Fine Art, collectible or fine antique that says something special for that special one. Give a Gift of Fine Art or a Treasure Antique … Many people do not realize this is possible even with the most modest budget. Years ago Neman Marcus started this with the “Christmas Wish Book” and others followed …Why not do your own with special art for the REAL collectors without spending hundreds of thousands of dollars. Take the time and think about the hobbies or interests of the ones you are giving a gift. Over the years many collectors love antiques Cups & Saucers and many can be purchased at $75.00 or less from fine English Derby, Worcester Gregorian Periods , singular tea bowl /bowls are favorites along with a selection of fine Gourmet tea’s makes a great gift. Many other fine porcelains dating from the Georgian Period to the Mid Century are priced from $25.00 and up depending on the work. The collector of fine literary works would love a Medieval Manuscript from the Nuremberg Chronicle or a Durer Wood Cut from “The Small passions,” first executed in 1511 at $125.00 and up. Often nice volumes of a limited edition of classic literature are illustrated with original etching, wood cuts or lithographs by Baskin, Austin or Brangwyn among others. A great gift for the host or hostess can be a nice porcelain vase or decorative dish by Wedgwood, Waterford, Spode, Royal Doulton and others which then can be filled with favorite sweets and packed as a gift basket…. Many love Crystal Goblets (Waterford perhaps a pair with a nice bottle of wine never loses appeal.) If a person loves silver, find a piece of the silver or china pattern they may not have and would love to add to their collection. Many company’s make great gift sets that are no longer made BUT can be found on the secondary market in antique and replacement shops. For the Art Lover, a nice Limited Edition Print by James Whistler, Matisse, Manet, Renoir or other modern masters. For the true traditionalist collector with more in the budget try Rembrandt’s (etched by Durand or a student after the artist exactly line for line after Rembrandt) for $75.00 and up. If your budget allows, several etchings executed by Rembrandt and pulled from the artist copper plate at $ 2,000.00. Giving a special gift will give the recipient a life time of precious enjoyment when you know what really matters. It is the energy and effort you take to give a gift that makes a statement of yourself and the person you wish to please. It’s not the price, it is the planning and the knowing what is a special gift. Candlewood Yankee Fine Art and Antiques Offers a wide selection of both Fine Art and Antiques priced from as little as $25.00 to several thousands of dollars. Something for every occasion and budget. Please visit our site. Shop early for a better selection and save the drama of “Holiday Shopping,” for the theatrical crowd.